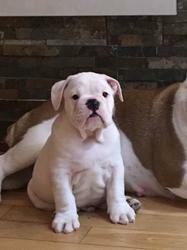 We have available a fantastic litter of british bulldogs.KUSA Registered, 1st vacc'd, microchipped and vet checked. Excellent bloodlines dad is Ryvonlou Freedom Fighter Mystyle from ocobo including admireabull and pheorm lines. Mum is merriveen, bizkai and southgate lines. Good bone and coat. Bred and raised in the family home. 3 Girls and 1 Boy available Real friendly and playful little bundles of joy. All wormed and flead up to date.